If you walk along the Lastenstraße, the supply road that parallels the even more splendid Ringstraße, you can walk from the MuseumsQuartier, past the Volkstheater and the Palais Trautson; then you cross a street and you stand directly at the main gate of yet another enormous Baroque palais, the Palais Auersperg. Tourists often learn of the palais through men in tacky historic costumes that sell over-priced tickets for classical concerts in Vienna. The Palais Auersperg, which also serves as a hotel and houses a restaurant, is one of the venues where these concerts take place. The construction of the palais probably dates back to the time of Sir Karl von Weltz. The low-ranking nobleman had purchased the land with a house in 1708. The house that was part of the property was called "Rottenhof". In 1721, the Italian count Marchese Girolamo Capece di Rofrano bought the Rottenhof and hired a decent architect for the re-development of the property. This architect was probably Lukas von Hildebrandt, a star among Vienna′s late Baroque architects. The extent of Hildebrandt′s involvement is controversial, and art historians think that his lifelong rival and nemesis Johann Bernhard Fischer von Erlach has also contributed to the plans. The work of both architects might be purely fictional - but helped to increase the value of the palais. The only thing certain is that a rather unknown, third architect named Johann Christian Neupauer played the most important role in the development of the palais. The Palais Rofrano later went to the Kinsky family and was let to the general Friedrich Wilhelm Prince of Saxony-Hildburghausen in 1760. The prince was a legendary host who knew well how to play the Baroque spiel of courtly representation and politics. He transformed the Palais Rofrano into a showcase for music, balls and receptions and built stables, ball rooms and reception venues. The Palais Rofrano had finally turned into an extensive Baroque ensemble. The court composer Christoph Willibald Gluck supposedly performed in the Palais Rofrano on many occasions. In 1777, the Palais Rofrano was sold to Johann Adam Prince of Auersperg. 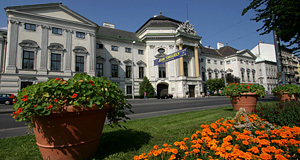 It was refurbished extensively, gained a "Rotunde" performance hall at the Lange Gasse entrance and changed its name into the known Palais Auersperg. In 1786, Wolfgang Amadeus Mozart directed the first night of his opera "Idomeneo" in the palais. The Palais Auersperg is a typical "Gartenpalais" - for more on the history and ‘classification′ of Austria′s Baroque palaces, read my article on Vienna′s Palais. As a typical Gartenpalais, the Palais Auersperg had an extensive park with formal gardens. Like in many Gartenpalais, this garden was re-modelled into an English-style landscape park in the 19th century, when Baroque constraints had fallen out of favour. The second Auersperg landlord, Vinzenz Carl Prince of Auersperg, re-modelled the building again in 1853. The appearance of the building was altered again shortly after this move, in 1880: The façade was extended and the Lastenstraße was lifted to accommodate the increase of traffic in Vienna. With the collapse of the Empire after WWI, the age of palais ended. A fire had destroyed parts of the Winterreitschule stables of the Palais Auerspberg. Yet it remained the private property of the Auersperg family. Until 1944, Christine Princess Croy-Dülmen nee Auersperg and her family lived in the upper floor of the Palais. In the later days of WWII, the Palais Auersperg staged another historic moment: It was here that in 1945, the Austrian resistance group "O5" had its secret headquarter. Between 1945 and 1955, the Palais Auersperg was the headquarter of a different group: The military police of the allies. The interiors of the Palais were altered significantly after WWII, mostly to accommodate the restaurant and later the hotel that moved in. The garden - smaller than the original grounds, but still recognisable as a 19th century English garden - is not open to the public. The Palais Auersperg is considered as one of the most important Baroque Palais in Vienna. Attraction nearby are numerous, so I will concentrate on those within a five minute walking distance: The Houses of Parliament, the previously mentioned MuseumsQuartier, the Volkstheater, the Justizpalast; the Palais Trautson, now Ministry of Justice; the Vienna City Hall, the Naturhistorisches Museum and Kunsthistorisches Museum; the Burgtheater and the Hofburg Palace with its many attractions.